Ambassador Olson poses with hundreds of alumni at the opening ceremony of the 2015 International Women’s Empowerment Conference in Islamabad, Pakistan. 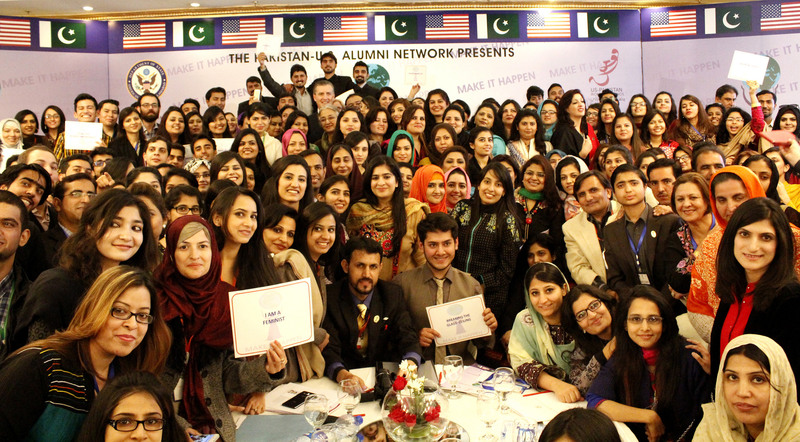 The 2015 International Women’s Empowerment Conference (IWEC) in Islamabad, Pakistan inspired more than 300 exchange alumni to “Make it Happen.” The “Make it Happen” theme captured the spirit of UN Women’s HeForShe campaign, which encourages men and women to work together to achieve gender equality. U.S. Embassy Islamabad, in partnership with the Pakistan-U.S. Alumni Network and the U.S. Pakistan Women’s Council, hosted the conference and welcomed alumni delegations from Afghanistan, Bangladesh, India, Nepal, Sri Lanka, and the Maldives. U.S. Ambassador Olson and Ms. Khawar Mumtaz, the Chair of Pakistan’s National Commission on the Status of the Women, opened the conference by highlighting achievements of notable Pakistani women who have charted a path for continued progress. After the empowering opening, participants attended discussions led by a slate of thirty respected leaders and distinguished speakers, including the first Pakistani women to summit the world’s seven tallest peaks. Through a series of interactive workshops and brainstorming sessions, alumni gained the necessary skills and resources to effectively advocate for the rights of women in girls in their communities and around the world. Alumni concluded IWEC 2015 by leading four service projects, centered on underserved communities. The projects engaged children at a women’s shelter through sports, and persons with disabilities through a guided tour of the Pakistan National Monument. IWEC 2015 helped forge strong alumni relationships across borders, which will strengthen the international exchange alumni network in South Asia as its members seek solutions to common challenges around the world.